SMLunch: Social Media Lunch | It is simple. Lunch is about networking. SMLunch is back! And this time, we’re trying something entirely new. Join us aboard the San Juan Clipper for a lunch-hour scenic tour of Elliott Bay with marine life health and welfare organization SR3. Standing for “sealife rescue, rehabilitation and research,” SR3 will be teaching us how we can help support and nurture sea animals in our region. Lunch will be provided on board by one of the rising stars of West Coast catering, Food La La. We hope you’ll join us for some amazing food, a beautiful cruise and engaging discussion. There are only a select number of spots available for this event, so grab your ticket today! Registration will begin at 11:30 a.m. and the event will go from 12-1 p.m.
We’re excited to share some amazing food, great views and even better company for September’s SMLunch. Join us on September 8 from 12:00 – 1:30 p.m. at Goldfinch Tavern at the Four Seasons Hotel Seattle. Acclaimed restaurateur Ethan Stowell’s newest concept has landed in Four Seasons Hotel Seattle. Enjoy simply prepared Northwest food and drink by Chef Joe Ritchie served in a sociable space inspired by sweeping waterfront views. Sip wine or craft cocktails from the center bar or gather friends by the fireplace. Reserve a special occasion or private party from one of two private dining rooms, each accommodating up to 16 people. Serving breakfast, lunch, dinner, happy hour and weekend brunch. Goldfinch Tavern is located inside the lobby of the Four Seasons Hotel Seattle at 99 Union Street in downtown Seattle. For SMLunch in August we’re trying something new, SMLunch: After Hours! Join us at Tutta Bella Neapolitan Pizzeria in the Westlake/South Lake Union neighborhood on Wednesday, August 5 from 4:00 – 6:00 p.m. Not only will the company be great, but the selected food and drinks from Tutta Bella will not disappoint. At the event you will experience a pizzaiolo making wood-fired pizzas using centuries-old traditions and be entertained by stories of Napoli. You will get to taste some of Tutta Bella’s favorite antipasti and pizzas, as well as sips of signature craft cocktails. Finally, we’ll learn more about Tutta Bella and their involvement with community groups across the Seattle-area. Beyond delicious tastes, learning more about Tutta Bella and great networking we will be offering a chance for attendees to win a “Cena Evento,” or a dinner for 10 valued at $225. You must be present to win. Get your tickets today, and we will see you on Wednesday. Spring has officially arrived and we are excited to announce April’s SMLunch will be hosted at the delicious Lucia: Italian Kitchen + Bar. Join us on Friday, April 24th from 12pm to 1:30pm in Green Lake Village right in the heart of the Green Lake neighborhood. Along with our usual networking, international communications professionals will be joining us ready to meet new contacts in Seattle! Lucia: Italian Kitchen + Bar in Green Lake blends modern and sophisticated aesthetics with a warm, relaxed environment. The menu offers culinary delights made from scratch with the finest and freshest ingredients. Our three course meal includes tasty items such as Spaghetti Bolognese, Porcini Mushroom Sacchetti and Tiramisu. It’s hard not to get excited over a meal like this! Don’t eat lunch alone; join us for great food and an informal, fun networking experience. Be sure to bring business cards and come ready to mingle! You can purchase tickets here and join our event on Facebook. Also, interact with us by tweeting @TheFeareyGroup and using #SMLunch.We look forward to seeing you then! 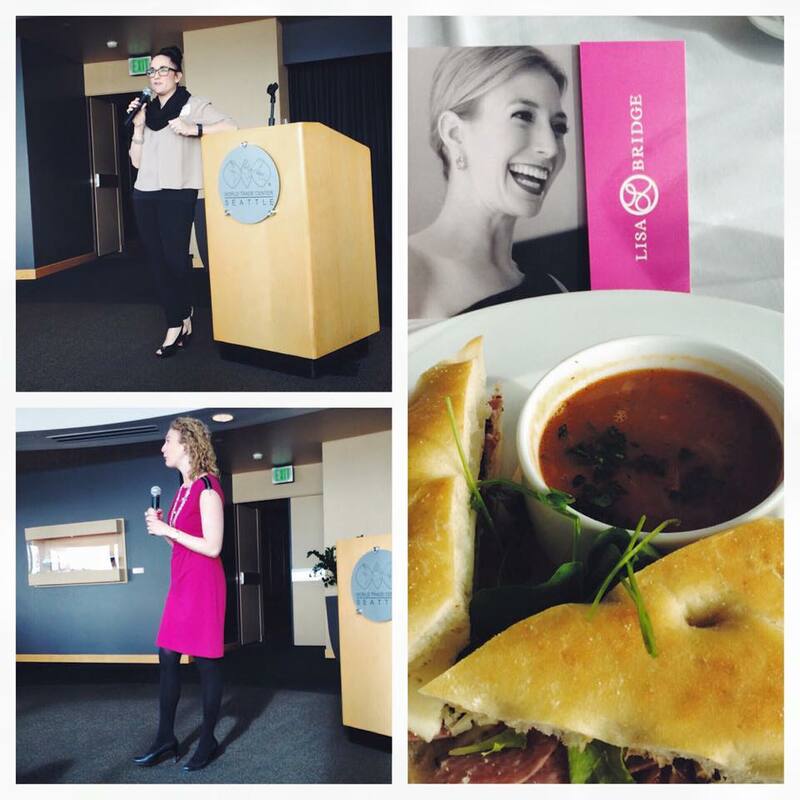 Thank you to all who joined us at our February SMLunch at the World Trade Center Seattle on February 10 in support of Lisa Bridge and her new collection! A big thank you to the World Trade Center Seattle for accommodating us in their wonderful space. Thank you Lisa for bringing a little extra sparkle to our day! Molly Mesnick, part of KISS-FM’s morning Bender Nation, joined us at the lunch with some fabulous examples of how to leverage social media. Partnering with Ben Bridge, Molly is hosting a live “How to Wear It Wednesday” social contest every Wednesday morning! Also on Wednesdays, check out the KISS-FM homepage which will be solely decorated with the Lisa Bridge Collection brand! On the KISS-FM homepage is Molly and Lisa’s “Share It to Wear It” social media contest. Listeners can win the week’s featured Lisa Bridge piece by simply sharing Molly’s website images of the piece on any of their Facebook, Twitter, or Instagram social networks! To enter, use the tag #HTWIW (How to Wear It Wednesdays) when you share the piece with your friends on any of the three social networks and you will be automatically entered! Finally, if that isn’t enough to create buzz, there is another contest! It’s called “Win to Get In – Girls Night Out”. Listeners can win entrance to an exclusive, private concert hosted by Molly at Trinity Nightclub in Pioneer Square! To get in, KISS listeners must enter to win on the radio’s website. Again, thank you to everyone! SMLunch would not be possible without you. Check in soon for news about the next SMLunch in March. Learning more about social media and how local brands are using the platforms should be on the top of your to-do list, especially in Seattle where countless tech innovations are setting the new norm every day. The Fearey Group’s Social Media Lunches are a terrific way to bring together bright minds from all over Seattle area for a social media workshop and networking. We invite you to our latest Social Media Lunch at the Seattle’s World Trade Center on February 10th to learn about Ben Bridge’s first new product launch in over ten years and how they are utilizing digital and social platforms to create buzz and generate sales. They’re leveraging social connections, website takeovers and radio partnerships while also connecting with Seattle fashion bloggers. Join the The Fearey Group, Lisa Bridge and Molly Mesnick, KISS-FM’s morning drive host and station fashionista, for lunchtime learning, networking and fun! Get your tickets for the #LisaBridge SMLunch at brownpapertickets.com and join us at the World Trade Center in Seattle on February 10th at Noon. You can check out the SMLunch Facebook event page and RSVP your attendance. Don’t forget to check it out the Lisa Bridge collection – Valentine’s Day is not far away!